What is the difference between UARS and OSA? One of the key differences between upper airway resistance syndrome and obstructive sleep apnea is that apneas (pauses in breathing) and hypopneas (decreases in breathing) are either absent or very low in patients with UARS. 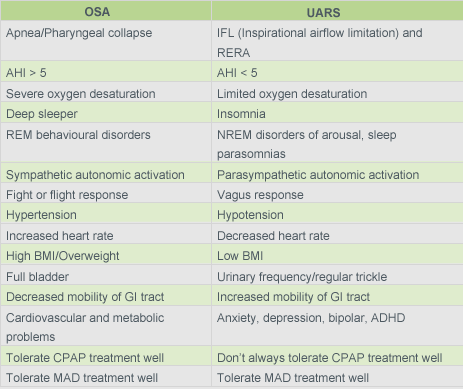 Patients with OSA are often overweight or obese (although they can be of normal weight), whereas patients with UARS are often of average weight. OSA is twice as likely to affect men as women, while UARS can affect men and women equally. Obstructive sleep apnea is related to many more long-term health conditions as a result of apneas and hypopneas due to the decrease in blood pressure during apnea/hypopnea events, which can lead to increased risk of high blood pressure, heart disease, heart arrhythmias, stroke, and heart failure. Patients who fail to treat UARS can end up developing OSA and find themselves at risk for many health problems. People do not wake up one morning suddenly afflicted with obstructive sleep apnea. Rather, obstructive sleep apnea (OSA) is believed to be a progressive disorder that lies on the extreme end of a spectrum of sleeps disordered breathing. At the other end of the spectrum is benign snoring–snoring that has no impact on sleep health other than possibly disrupting one's bed partner's sleep. When the causes of snoring begin to progress from relatively harmless noise-making to the harmful sleep disorder of sleep apnea, it often first develops into upper airway resistance syndrome (UARS). 1What is the definition of OSA? 3What are the contributing factors for OSA? 4What are the signs for OSA? 5What are the consequences of OSA? 6What type of treatment is available for OSA? 7What is Health Renewal’s approach? 8What is the definition of UARS? 10What are the signs to look out for? 11What are the consequences in UARS? 12What treatments are available for UARS? 13What is Health Renewal’s approach? 14What is the comparison between OSA and UARS? OSA is the most common type of sleep apnea and is caused by obstruction of the upper airway. It is characterised by repetitive pauses in breathing during sleep, lasting between 20-40 seconds, despite an effort to breathe. There is an associated reduction in blood oxygen saturation. When there is obstruction of the upper airway during sleep (due to poor muscle tone, structural causes or increased soft tissue around airway). Assess possible OSA in all patients with Obesity, Hypertension, Type II Diabetes and unexplained inflammation. A high score on OSA/UARS questionnaire indicates high probability (see questionnaire). Recommended blood tests are: hs-CRP, fasting insulin, fasting glucose, HbA1C, saliva cortisol. Doctor might Refer patient for Polysomnography and then evaluate all test results during follow-up and make recommendations. Treat associated conditions such as Hypertension, Inflammation and blood sugar where appropriate. NB: Patient compliance with CPAP and MAD is not great and it is up to us to make sure the patient understands how big an impact their OSA or UARS has on their health and that treatment is essential. UARS is a sleep disorder characterised by airway resistance to breathing during sleep. The primary symptoms include daytime sleepiness and excessive fatigue. Abnormal upper airway resistance due to any reason such as sinus congestion etc. producing respiratory effort related arousals (RERA's). There is little or no blood oxygen desaturation. Human evolution has left us all vulnerable to UARS due to the position of the larynx and our relatively flattened faces which has reduced the size of our airway significantly. Evaluate possible UARS in all patients with Hypotension, Insomnia, Asthma, Chronic Sinusitis and Chronic GERD/LERD.A high score on OSA/UARS questionnaire indicates high probability (see questionnaire).Recommended blood tests are: hs-CRP, fasting insulin, fasting glucose, HbA1C, saliva cortisol.Doctor mightrefer patient for Polysomnography and then evaluate all test results during follow-up and make recommendations. Treat associated conditions such as Sinusitis and GERD where appropriate.